What Ley noted (but Berg did not) — and here I don’t mean to pick upon either, because both are fine writers — is that Hess had thrown 42 pitches in relief on March 28. meaning that he was working on three days of rest, which helped to explain why Hyde pulled him after 82 pitches instead of pushing him further. Indeed, the manager cited a concern for the pitcher’s health and the long season as primary in his thinking. To Berg’s point, the fact that Hess was about to face the middle of the Blue Jays’ batting order (Justin Smoak, Randal Grichuk, and Rowdy Tellez, admittedly not exactly Murderers’ Row) probably entered into the manager’s decision as well, given that the Cubs’ former bench coach was chosen for this job in part because it was time to bring the Orioles into the 21st century, analytics-wise. For what it’s worth, batters hit .299/.371/.612 for a .408 wOBA in 97 PA against Hess last year under such circumstances. That wOBA was the ninth-highest out of 131 qualifying pitchers. Not Great, in layman’s terms. Pitch counts and other health concerns, the times through the order penalty, and the decreased novelty of the no-hitter — 27 since the start of 2012, about four per season — are all contributing factors in such decisions, and better pitchers than Hess (who finished with 0.0 WAR in 103.1 innings last year) suffered the fate last year, including AL Cy Young winner Blake Snell of the Rays (August 10 against the Blue Jays) as well as breakout performers like the Pirates’ Trevor Williams and the Twins’ Kyle Gibson. Those last two pitchers’ hitless outings took place on March 31 and April 1, respectively. Indeed, five of the 11 outings occurred between Opening Day and May 6, amid a season in which rain and cold weather cut into attendance in the early months. One of last year’s early-season hitless outings — a six-inning effort by Dodgers rookie Walker Buehler, against the Padres in Monterrey, Mexico on May 4, in what was just his third big-league start — became a combined no-hitter, something unseen in the majors since September 1, 2014, when Cole Hamels and three Phillies relievers did the trick. 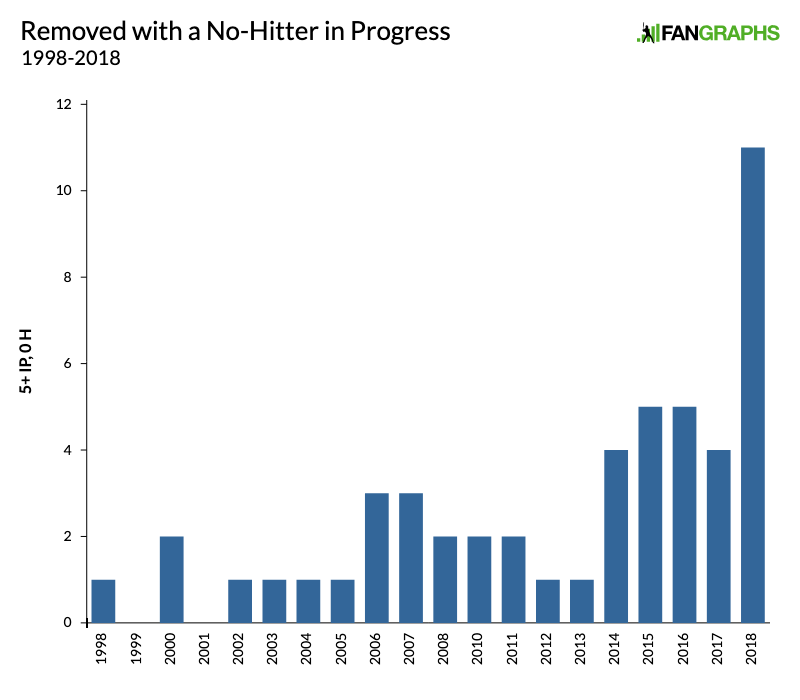 Even with the mounting frequency of these hitless outings, there has been just one other combined no-hitter since the start of 2004, a June 8, 2012 start by the Mariners’ Kevin Millwood against the Dodgers. Hess’s immediate successor, Pedro Araujo, wasn’t up to the task of continuing the no-hitter; he walked Smoak on five pitches then served up a 426-foot homer to Grichuk. The next two relievers, Mike Wright and Richard Bleier, allowed runs as well, and the game got close enough that the latter was credited with a save. Orioles gonna Oriole. As with the case of so many under-market contract extensions, to describe and analyze the increasing frequency of hitless-but-incomplete starts circa 2019 isn’t necessarily to condone it. Hess’s trip to the showers with his no-hitter in progress may have been a bit of a bummer for the pitcher and for Orioles fans watching from afar (I’m guessing few made the trip to Toronto). But anyone surprised that this is happening more often these days probably hasn’t been paying close attention. We hoped you liked reading David Hess and No-Hittus Interruptus by Jay Jaffe! You said he threw 42 pitches 3 days earlier, it was 4 days earlier. 3 days rest.